Why hire Dublin electricians? Here are 10 good reasons. At the end of the day the final decision is always up to the consumer not the provider but we hope you will find this checklist helpful when making your decision. Why hire Dublin Electricians, 10 good reasons. 25 years of established successful trading, approved for work for social housing, letting agents and insurance companies. We only employ top quality, fully qualified RECI electricians. Comprehensively covered by insurance to the amount of €6.5 million. A complete range of the highest quality electrical services provided, no job too big none too small. All work we carry out is covered by our standard 1 year parts and labor guarantee. The best prices in the Irish market place for our electrical services, this is why we advertise them plainly and clearly on our website. We will happily come out and provide free quotations without obligation on any work that you may need. Our 24 hour emergency Dublin electrician on call service means you can count on us to be able to help you at any time of the day or night. Reliability. You say a time and we'll be there. You ask how long a project will take, we tell you and it will be completed on time even if we have to bring in more team members to do so. We always adhere to our contractual obligations as we know our excellent reputation is at stake. Flexibility, we work around you. We will always arrange a time that suits our clients to conduct any electrical work. This is so that you can carry on your daily routine as normally as possible. We only employ tidy, polite and courteous Dublin electricians in our team. Our staff are always prepared to go the extra mile and nothing is to much trouble. We will always leave your property in clean state on completion of our work. We truly believe that these are the things you need to make sure of when hiring electricians in Dublin. We know we always abide by our own charter but sadly not all companies and individuals provide this sort of service. 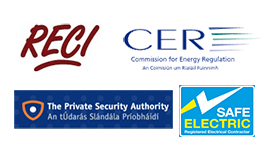 For professional advice or to request a free quote just call one of our electrical project managers on 01-6874854. Call one of our senior electrical works managers today on 01-6874854.